After so many months of waiting and wondering, the first of the big three meets to determine our 2012 Olympic team has come and gone. After marinating for a few days, here are my lingering impressions from the 2012 Secret Classics. Such was the case with Nastia Liukin. She was nervous during podium training and looked unsure before she mounted the podium for the beam. I thought, “Sigh, this is gonna be rough.” But the green flag went up and you SAW the change. She transformed in that moment. Nastia prepared to mount the beam with a look in her eyes that said “This, I know how to do.” It was a gymnastics moment I won’t soon forget. She went on to compete a solid, respectable beam routine. Oh, one that just happened to tie as the third highest score. Yes, I continue to have faith in her comeback. Aly just keeps getting back on each event, each performance with the same consistency. She has learned how to hit. And she just keeps hitting. Gymnasts CAN have floor routines that give me chills. I LOVED Anna Li’s dance through. It literally gave me chills. No matter where this venture takes her, I will always be grateful that she gave us that beautiful floor routine. And Sarah Finnegan. WOW. The girl is more breathtaking on floor every time she goes out there. I love her routine and love that she can get in so much difficulty with only three passes. Pass on the boring double back, thank you very much. These two moments were such highlights for me. Things that have become commonplace that should continue to wow me. Maroney on vault. 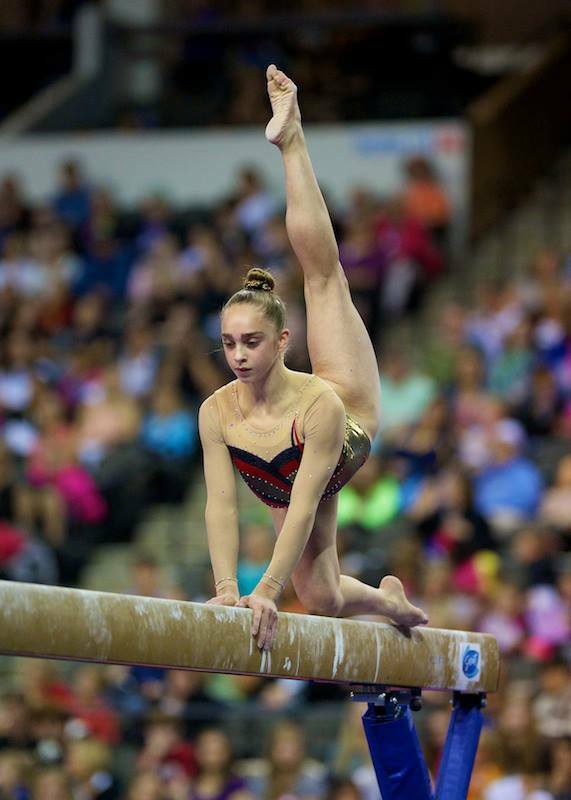 Wieber on beam. Douglas on bars. Raisman on beam and floor. These are spectacular performances that should draw praise again and again. But we have become so used to them they often go unmentioned. They were as beautiful to watch as ever. Once again, I am grateful to be in a time where the USA has amazing depth and so very many talented gymnasts.